The solution for treating and curing cows with strawberry foot / hairy wart disease and similar infections of the hoof. As the hoof is placed on the HOOFMAT, the cow’s own weight creates substantial hydraulic pressure to force solution through the hoof for maximum penetration. 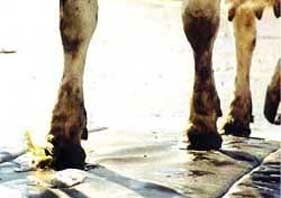 There can be no doubt about HOOFMAT’s effectiveness in ensuring full coverage of the treatment solution on the hoof. 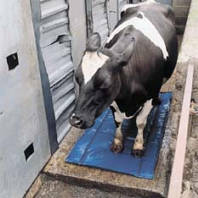 HOOFMAT is a more effective treatment than a conventional footbath. This is because it is used at the entrance to the milking parlour, rather than the exit, allowing the treatment solution to soak into the hoof for the duration of the milking time, before the cow walks in dirty conditions again. 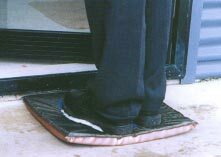 HOOFMAT is constructed from a super-strong polyfabric outer skin surrounding a highdensity foam interior. Lower cost to install and operate. Less harm to the environment. Good for 100,000+ cow walk throughs. Easier to manage and service. No large quantity of dirty water for disposal. 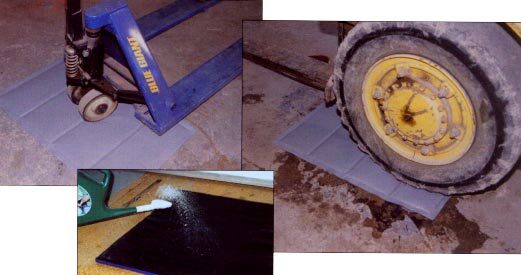 Before use, apply 1% *VIRKON solution onto the mat with a bucket or watering can. The HOOFMAT is 3’ x 6’ x 1 (1.8m x 0.9m x 31mm) and will hold about 6 Imperial gallons (30 litres) of solution, which will treat about 80 dairy cows. HOOFMAT can easily be topped up during milking of larger herds. After use, HOOFMAT is simply hosed off - both sides, hung over a rail and left to drain. Refill the next morning before milking starts. 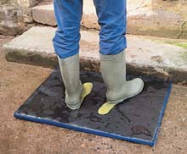 ** We recommend Virkon as a safe disinfectant to use with our mats. Disinfectants containing chlorine or similar products should never be used.